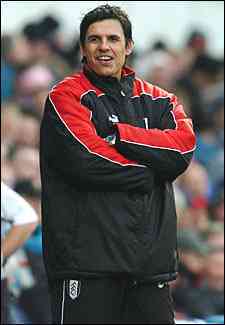 Fulham boss Chris Coleman has revealed he is 'very close' to agreeing a new long-term deal with the club. Coleman was rewarded with a one-year rolling contract last summer for successfully steering the Cottagers to Premiership safety after Jean Tigana had departed with five games to go. Although a rookie in managerial terms - Coleman is the youngest boss in the Premiership - the move has paid rich dividends for chairman Mohamed Al Fayed who has seen Fulham's fortunes flourish under the Welshman's guidance. The Cottagers were tipped to struggle but they soon made a mockery of their critics by occupying fourth place in the league for long periods until a Christmas slump in form saw them slide down the table. But they still have a superb chance of claiming a UEFA Cup spot and that would be a fitting reward for a manager who is held in high regard by players, fans and media alike. Coleman is keen to commit his future to the club but insists the new deal must allow him to continue working alongside his assistant Steve Kean. 'Myself and Steve Kean are very close to agreeing terms,' he said. 'Steve and I are a partnership, so we both have to be happy with what is agreed.